American congress-man; born in New York Oct. 29, 1809; died Aug. 29, 1897. When twenty years old he joined the volunteer fire department of New York, as a member of engine company No. 9, and continued in active service five years. Hart was a Jackson Democrat, and one of the challengers at the polls in the exciting election of 1832. In 1845 he was elected alderman of the fifth ward, and was reelected the following year, but refused a third nomination. Subsequently he was appointed a delegate to the Democratic state convention, and as a member of Tammany Hall was elected chairman of the Tammany general committee in 1849. In 1851 Hart was elected to Congress by a heavy majority. Under President Buchanan's administration he was appointed surveyor of the port of New York, and on the expiration of his term served for a year in the same office at President Lincoln's request. 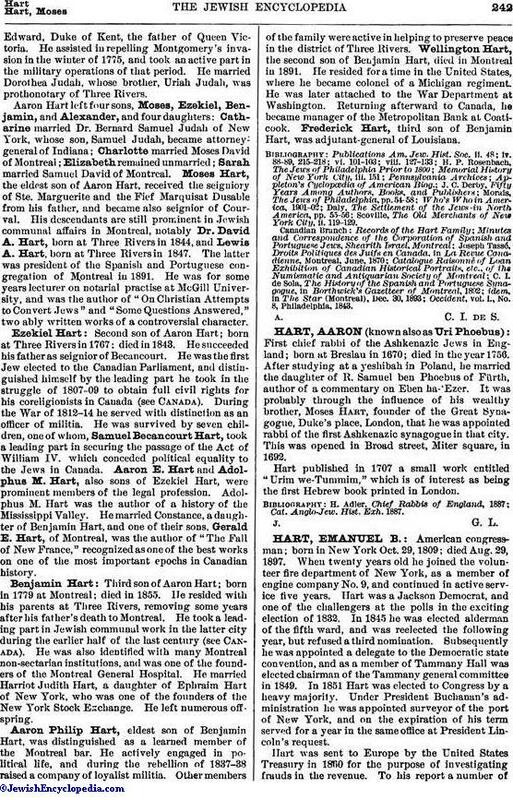 Hart was sent to Europe by the United States Treasury in 1860 for the purpose of investigating frauds in the revenue. To his report a number ofimportant reforms have been attributed. In 1867 he was offered the nomination of the sixth congressional district of New York, but refused; in 1868 he was a presidential elector. 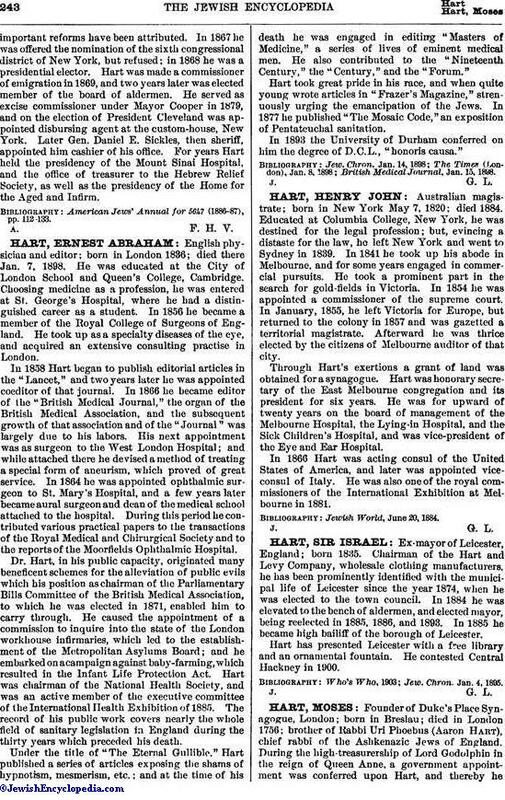 Hart was made a commissioner of emigration in 1869, and two years later was elected member of the board of aldermen. He served as excise commissioner under Mayor Cooper in 1879, and on the election of President Cleveland was appointed disbursing agent at the custom-house, New York. Later Gen. Daniel E. Sickles, then sheriff, appointed him cashier of his office. For years Hart held the presidency of the Mount Sinai Hospital, and the office of treasurer to the Hebrew Relief Society, as well as the presidency of the Home for the Aged and Infirm. American Jews' Annual for 5647 (1886-87), pp. 112-133.